2014 has been the toughest year on record for Palestinian fishermen in the Gaza Strip, a union official said Tuesday. They faced recurring attacks before, during, and after Israel's summer offensive that left around 2,200 dead, and the periodic tightening of restrictions on their livelihoods has cost them millions. Head of the Gaza Fishermen's Union Nizar Ayyash told Ma'an that the fishing sector in Gaza lost an estimated $9 million, particularly as a result of the fact that Israeli forces prevented the Strip's 4,000 fishermen from engaging in any fishing during the 50-day summer war. This decline in revenues comes on top of the restrictions imposed for the last eight years as part of the Israeli siege, which severely limited the range Palestinians can fish in and led to a poverty rate around 90 percent for fishermen, even before the war. Ayyash said that while previously fishermen used to catch 4,000 tons of fish, the total had since fallen to less than 1,500. The economic hit Palestinian fishermen have taken over the past year comes in addition to the massive destruction of property they faced during the July-August conflict. Harbors used by fishermen were targeted and destroyed by Israeli forces during the summer offensive, with 36 fishermen's storage rooms destroyed and three partially damaged. 52 boats were also destroyed, in addition to the fishermen's possessions being burned in the destruction. Israel also detained Palestinians engaged in fishing numerous times during the year, carrying out 18 raids across the Strip in which 56 fishermen were detained. They also confiscated 21 boats and 14 fishing nets. 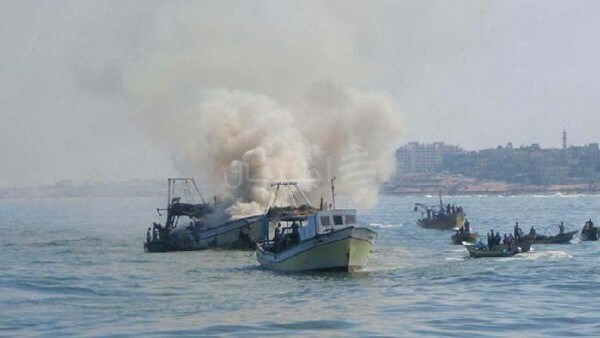 Despite the August ceasefire agreement, Israel resumed targeting Gazan fishermen soon after. Although the agreement ostensibly increased the fishing zone allotted to Palestinians from three nautical miles to six and was meant to push it to twelve, fishermen say that so far Israel has kept it at six and has even attacked within that limit. All this despite the fact that the zone is technically set at 20 nautical miles, according to the Oslo agreements signed between Israel and the PA in the early 1990s. Researcher in the social and economic rights department of the Palestinian Center for Human Rights Azzam Shaath said that this year has been the most difficult year on record for fishermen. Shaath added that he hoped that "fishermen's suffering would end after the Israeli offensive on Gaza since the peace agreement included them, but that did not happen and their suffering became worse since Israel did not commit to the agreement and prevented fishermen from doing their jobs." A recently released video of a speech made by Deputy Knesset Speaker Moshe Feiglin, in July of this year, shows Feiglin calling for an Israeli sponsored bloodbath in Gaza, according to the PNN. "We have a war over here, and the war is not against the Hamas and there's no innocent people around it." "So these are the two rules. First of all, we should look for victory, we should win, we should take over, we should destroy Hamas and take over the whole city and we should do it according to Jewish law and not according to this immoral ideas that putting our soldiers in danger..."
"We're not defending ourselves, we're fighting for justice. It's ours. This is the first thing we should understand. And we should take it over, capture the whole Gaza Strip – as we did in 1967 and I'm talking about the right goal, the right goal should be victory, nothing less than that. Victory means destroying your enemy, and take over the place." Continue reading at the Palestinian News Network. "Hitler was an unparalleled military genius. Nazism promoted Germany from a low to a fantastic physical and ideological status. The ragged, trashy youth body turned into a neat and orderly part of society and Germany received an exemplary regime, a proper justice system and public order. Hitler savored good music. He would paint. This was no bunch of thugs. They merely used thugs and homosexuals." 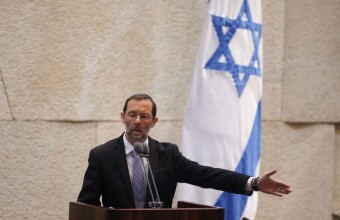 Feiglin has insisted that his comments have been taken out of context in a smear campaign against him by left-wing journalists. He has since been banned from entering the United Kingdom. A recently released video of a speech made by Israeli leader Moshe Feiglin in July of this year, shows Feiglin calling for an Israeli sponsored bloodbath in Gaza. "Israel should invest a lot of money [that's] today is being invest in rockets, in barbed wires, in guards in every coffee shop and so on, exactly in that target. So in 10-15 years the Arab population in Gaza will be much smaller and the minority that will decide to stay can stay, somehow with the same position as the Arab in East Jerusalem did. Not immediately, not automatically– they'll have to go through a few tests and so on." The other big problem with this is that the Palestinian people are in no way perpetuating genocide on the citizens of Israel. The Israeli's are clearly in control of the region and as November 4, Gaza has been almost completely isolated from the world. The Palestinian people's movements are restricted by Israel, not the other way around. Border closings have limited the people's access to medical supplies and other humanitarian aid, which is critically needed after the 50 day long Israeli attack on the region this past summer. ...designate certain open areas on the Sinai border, adjacent to the sea, in which the civilian population will be concentrated, far from the built-up areas that are used for launches and tunneling. In these areas, tent encampments will be established, until relevant emigration destinations are determined. Whether Israel is already operating Nazi-style concentration camps is questionable. In November, Addicting Info's Kerry-Anne reported that Israel had imprisoned an 11 month old child, along with her mother and two-year-old sister. Since the Israeli occupation of Gaza began, more than 720,000 Palestinian men, women and children have been imprisoned by the Israeli government. In 2011, a single Israeli soldier was taken prisoner by Hamas. In exchange for that single prisoner, Israel released 1,027 Palestinian captives. The hypocrisy of the Israeli government is beyond appalling. Israeli leaders drawing on comparisons to World War II, would do best to start by looking at themselves in a mirror. 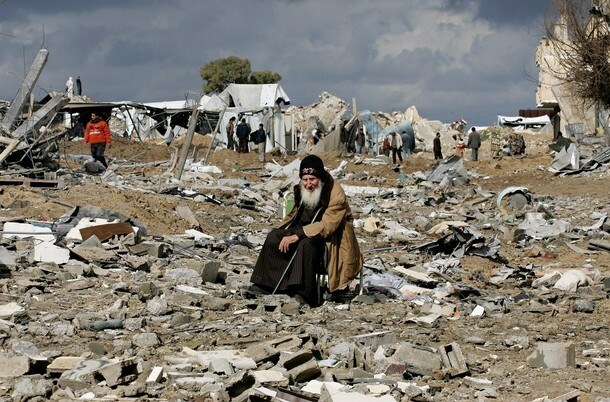 The list of war crimes and human rights violation committed by Israel goes on and on and on. Whether they are executing unarmed Palestinian citizens, imprisoning infants and children or torturing and burning people alive, Israeli soldiers are far from innocent victims in this conflict. "You understand that you are the good guy and they are the bad guy, you represent good, they represent evil." ...the personification of the devil as the symbol of all evil assumes the living shape of the Jew. What is truly evil is any group of people labeling any other group of people 'evil,' while openly calling for mass genocide against them. Turkey pledged to sponsor 2,000 Palestinian orphans who lost their parents or breadwinners during the last Israeli war on the Gaza Strip. This came in a sponsorship protocol signed between the Palestinian ministry of social affairs and the Turkish Red Crescent, under which each orphan will receive 103 dollars monthly. The protocol was signed on Monday by deputy minister of social affairs Yousuf Ibrahim and head of the Turkish delegation Arda Tarhan at the headquarters of the ministry in Gaza. "Helping orphans, who lost their main breadwinners, is one of the loftiest deeds that can be done in such conditions," Ibrahim stated during the signing ceremony. He called on UN Secretary General Ban Ki-moon to reconsider Special Coordinator for the Middle East Peace Process Robert Serry’s reconstruction plan and to unconditionally relieve the suffering of the people of Gaza. 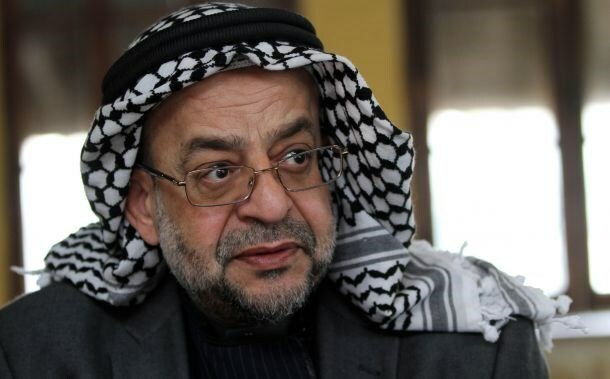 Dr. Youssef, meanwhile, welcomed the Palestinian ministerial delegation’s visit to Gaza Strip, calling for uniting all national efforts for accelerating the reconstruction of Gaza. He called on the Palestinian unity government to work on the regional and international forums for the opening of all Gaza border crossings. "Such continued Arab and international silence towards the siege must be ended", he said. Dr. Youssef hailed the national and Islamic forces who participated in the national day to break the siege on Gaza and to accelerate its reconstruction. He called on the Egyptian authorities to facilitate building materials’ access into the Strip according to Cairo conference’s recommendations. He called upon the humanitarian organizations and charitable institutions, which announced its financial contributions during the Istanbul and Qatar conferences, to provide more practical steps in coordination with the commission to support the people of Gaza. "Al-Shejaiya" whenever this name is mentioned, the first thing that occurs to the mind is the brutal Israeli massacre whose catastrophic results are still remaining until today after this long period which was enough to at least remove the rubble and revive the hope of reconstruction in its inhabitants’ hearts who are living in patchy tents next to their destroyed houses. 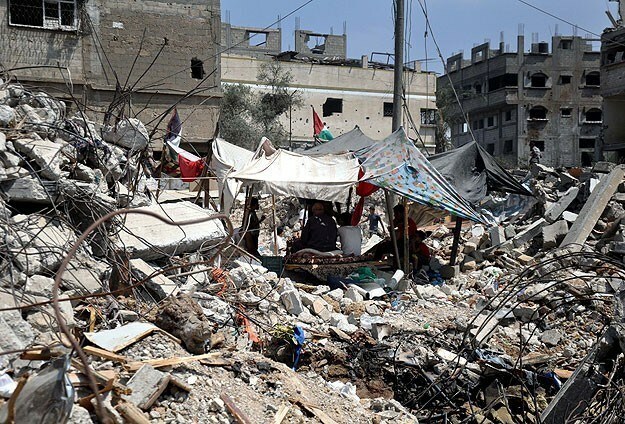 Hundreds of al-Sha'f and al-Nazzaz streets’ residents in eastern al-Shejaiya are living in tents and no one is paying any attention to their cries, prompting them to march on the National Day and gather with the Palestinian factions at al-Shejaiya crossroad in a gathering that grouped hundreds of affected people to express their indignation over this unjustified disregard of their suffering. Abdullah Elewah, 50, whose two-storey house was destroyed, said: "For how long will the reconstruction be delayed? We are here today to demand Egypt, the Unity Government, Hamas and Fatah to have mercy on us; we only want to see signs of reconstruction, how long should we endure this situation?" He added: "We are six persons living in one tent; my son is married and he has a baby girl that needs a special care and the rain water is falling on us." Muhammad Al-Batesh, 30, whose house was partially destroyed attended the gathering although he thinks that it is just a waste of time. "I've only received one thousand dollars, I spent them on buying the essential needs for the children and I live in a caravan next to my destroyed house; and I am here today to express our anger over the reconstruction false promises. The reconstruction materials are very few and expensive and we are unemployed." Ahmad Suleiman, 28, attended the gathering to show solidarity with his homeless neighbors. 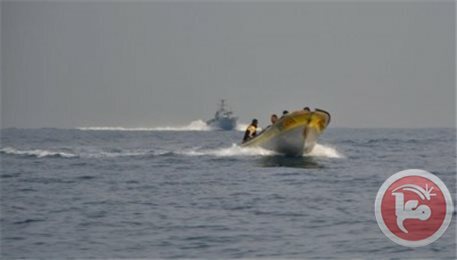 "Thank God my house wasn't destroyed, being here is the least I can do for those affected," he said, adding: "Fear of Allah and unity is the only way to lift the siege and reconstruct Gaza"
Israeli navy vessels opened heavy machinegun fire at Palestinian fishing boats off the coast of Gaza Strip on Tuesday morning. Palestinian sources told Quds Press that the incident took place off the northern coast of the Strip and that no casualties were suffered as a result of the shooting. They said, however, that the heavy gunfire forced fishermen to return to shore. The incident constituted yet a fresh breach of the ceasefire agreement reached with Palestinian resistance factions in Gaza under Egyptian mediation on 26 of last August.